Heydar Aliyev was an outstanding statesman who played a decisive role in formation of independent Azerbaijan and laid the foundations for a strategic partnership with Russia, said Russia's State Secretary and Deputy Foreign Minister Grigory Karasin at the opening of the Russian-Azerbaijani historical and documentary exhibition "Heydar Aliyev: Personality, Mission, Heritage" at the Heydar Aliyev Center in Baku May 10. "This return to the origins of our relations is very symbolic. This is a reminder of the colossal joint efforts to strengthen and develop friendship between our countries and peoples, which was and is being maintained by the leaders of the two states and which Russia considers an important foreign policy priority. As we all remember, Heydar Aliyev became the head of the Azerbaijani state twice - in 1969 and 1993. Moreover, the decisions taken by him in 1993 in the midst of internal strife, the hard Karabakh war and the collapse of the economy, demanded enormous courage and the unique life experience that only Heydar Aliyev had. In the situation of the political crisis and absolute time pressure, he took extremely verified and, as it turned out, fateful decisions - the Bishkek Protocol in May 1994 brought Azerbaijan a difficult but much-needed peace, and the subsequent major international contracts, including those with the participation of Russian partners, and large-scale investments in the long-awaited economic stabilization," Karasin said. The deputy minister said Heydar Aliyev has always been distinguished by his genuine interest in business and people, an excellent understanding of real life, and the desire to achieve concrete, practical results. "He was a man with a huge potential, and I think this potential was not fully used in the USSR. In due time such an opinion also prevailed that if Heydar Aliyev becomes the head of the Soviet government then, in the 80s, the country could follow a softer evolutionary path of development, akin to the one that once was launched in China by Deng Xiaoping. It is well known that he was an amazingly devoted and loving son, brother, husband, father and grandfather. He was able to make friends and somehow especially warmly appreciate people, especially talented people," Karasin added. Karasin stressed Heydar Aliyev's contribution to establishment and development of Azerbaijani-Russian relations. "It is not surprising that Azerbaijan is traditionally sensitive to the Russian language, which is spoken by almost everyone – both in Baku, Lankaran and Ganja. Over 300 Azerbaijani schools are working to preserve the inherited common educational and cultural space, where education is conducted in Russian. For Heydar Aliyev, Russia was an integral part of his life, and in political sense, the closest and reliable partner. Heydar Aliyev's legacy is alive and his work is continued by President Ilham Aliyev. Therefore, we are optimistic about the future of our bilateral relations. 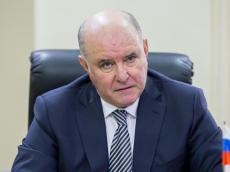 And we have no doubt that in the future they will develop and strengthen in accordance with the precepts of Heydar Aliyev for the benefit of our two countries," Karasin added.